Working in a noisy environment every day without ear protection is not only unsafe, it’s a guarantee of NIHL, which is permanent but preventable. 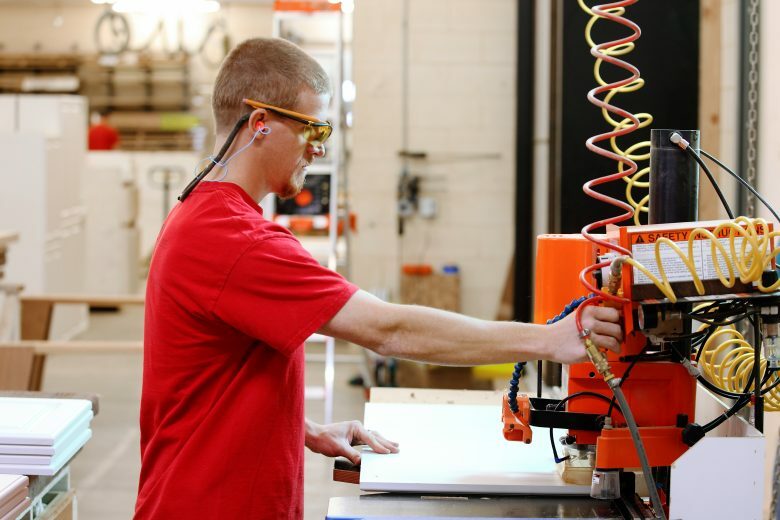 In fact, occupational hearing loss is one of the most common work-related illnesses in the US, which is why it’s important to provide proper protective equipment and educate workers on the importance of using it. Providing workers with the right hearing protection devices (HPDs) and associated training can make a huge difference to their hearing safety. A wide variety of HPDs are available from PPE vendors, so it’s worth studying all the available options before committing to one. Some companies even provide clients with custom-made earplugs. Depending on the amount and duration of noise in a manufacturing setting, a mix of different options might be possible. (For example, providing ear plugs for low noise levels and also requiring the use of earmuffs for times when the levels rise). Workers should be trained on how to look after their HPD and how to use it correctly, including waiting for foam earplugs to expand inside their ear before entering a loud environment. Hearing protection training should also help workers understand that badly fitted or damaged earmuffs will not provide them with the protection they need. Managers should also take part in this training. This allows them to more effectively support noise-related PPE compliance and reassures workers that the program is important. Companies can also protect their employees’ hearing by addressing the problem of hearing-damaging noise itself. Providing workers with protection is always a good idea, but looking into noise-suppressing engineering solutions will address the core problem and create a safer work environment. Noise-reduction adjustments for conveyors, chutes, fans, hydraulics and other sources of noises are popular methods of combatting NIHL on the manufacturing line. Some are costly, but others can be reasonably priced and even a relatively small noise reduction of 10 dB can make a huge difference to workplace safety. NIHL is a very slow process, usually progressing without symptoms or pain, which is why it can be difficult to explain to workers how serious an issue it is. The right training and attitude can make employees realize that neglecting to wear ear protection or not using it properly might not seem like a big deal at the moment but will lead to serious hearing loss at a later date. Many people think that they can acclimatize to noise, but feeling like you’ve become used to loud sounds after prolonged exposure can actually be a sign of hearing damage. In addition, a belief persists that ears regenerate, and although a ruptured eardrum will often heal on its own, the hearing nerve and its sensory nerve cells do not. Addressing the faulty perceptions surrounding hearing safety is important to ensure employees understand the issue. Because the better they understand the problem, the more likely they will be to care about it. Are your workers neglecting their hearing protection despite being provided with the right type and fit? If so, it’s time to analyze the safety culture of your workplace. First of all, do the managers wear HPD when they walk the floor? Leading by example is vital and if you tell your workers how important it is for them to wear their equipment but management is excluded from this requirement then employees will think that maybe HPD is not so important after all. Do you encourage HPD use with a positive attitude and regular refreshers/reminders? Workers can simply forget to use PPE if they’re not used to the rules. Reminding them that their safety is important to you can encourage them to use the equipment. It will also allow them to develop trust in the company. Shouting and disciplinary actions might work short-term but they won’t lead workers to better understand the importance of ear protection and they won’t contribute to a healthy and positive safety culture. When was the last time you changed the posters or other visual reminders around the assembly line? If a poster reminding workers to wear their HPD is old, they are less likely to notice it because it has become part of the background. Regularly updating visual reminders might help you increase HPD compliance. There are many designs available from vendors or you can even create your own. A new image that grabs workers’ attention is definitely more useful than a 5-year-old, discolored poster peeling at the edges. Finally, consider the human factors at your workplace. Are people regularly fatigued, rushed or complacent? These states make people more likely to forget or ignore safety issues. Providing workers with human factors training will help your workforce recognize and address states of mind that influence noncompliance. Noise-induced hearing loss is a serious condition and preventing it in the workplace is not as simple as getting earmuffs and handing them out to staff. As with all safety issues, dealing with aural hazards requires tackling physical factors, human factors and culture—because all play a part in protecting workers’ hearing.